The telephone number for the meeting house is 01273 472276. If someone doesn’t answer straightaway, please leave a message and your call will be returned as soon as possible. Our email address is lewesquakers@gmail.com. If you have an enquiry you might like to fill out an Enquiry Form. Please don’t hesitate to get in touch if you have a general or a specific enquiry, as we would be very pleased to hear from you. 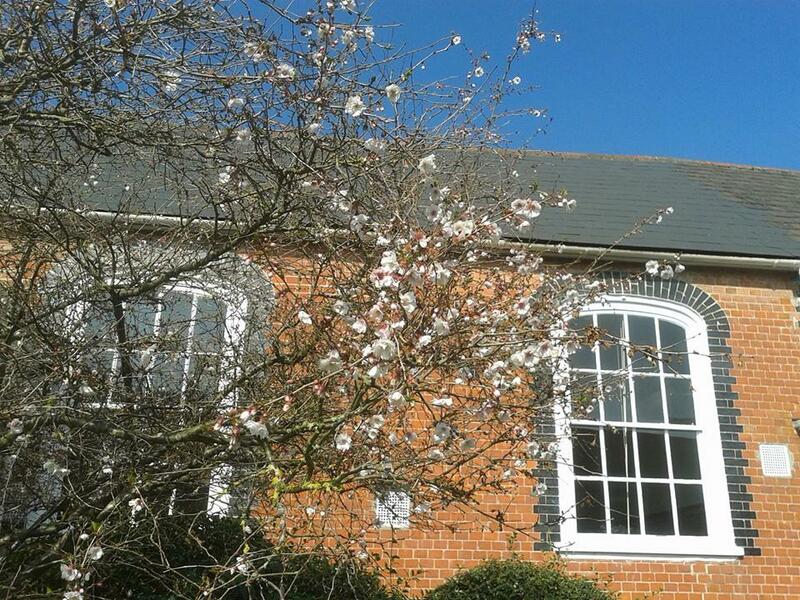 Lewes Friends Meeting House is located on Friars Walk between Styles Field (the entrance to Lewes Library) and Church Twitten (entrance to the All Saints Community Centre). If driving into Lewes, you will be directed around a one-way system. Approaching Lewes on the A2029, turn right so Waitrose is on your left, go over the traffic lights and you will find yourself on Friars Walk. A few yards on, the road narrows to a mini-roundabout. Prepare to turn right almost immediately. Follow the signs for Lewes Library. Turn right up Styles Field, where you will find a car park at the back of the meeting house. There are several car parking spaces there, which belong to the meeting. If you miss the turning for Styles Field, you cannot go back (due to the one-way system), but might find a space to park your car further along Friars Walk or Lansdown Place. Or turn left into the railway station car park at the top of Lansdown Place (where you will be required to pay for parking), then walk back to the meeting house. The meeting house is clearly marked from the road. If taking a bus, alight at Lewes bus station opposite Waitrose, and walk south along Eastgate and then Friars Walk, as indicated above. This is a 5 minute walk on level ground. 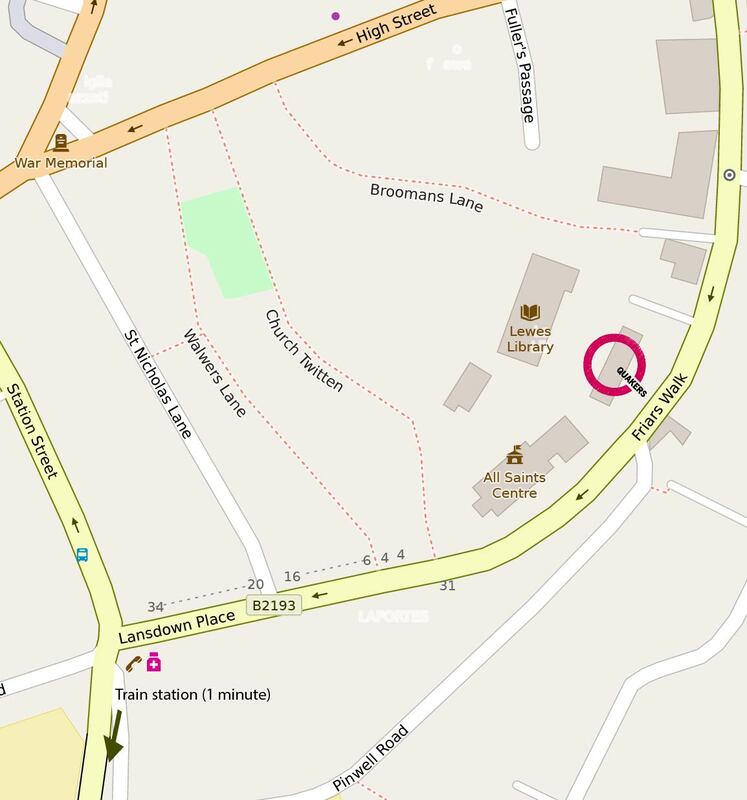 If arriving by train, from the railway station turn right and walk over the bridge over the railway lines, turn right into Lansdown Place which becomes Friars Walk after a few yards. The meeting house is on the left side, immediately after the All Saints Community Centre, clearly marked and visible from the road. This is a 5 minute walk.